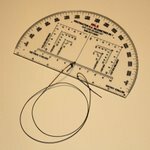 The Protractor RA 6" is a simple but effective way of plotting bearings taken with Prismatic or Lensatic Compass's onto maps. It also allows the user to measure bearings, find grid references and measure distances on maps and charts. Having long been a part of the British Army Commanders Kit this item is quick and easy to use for route plotting, target indication and location finding. Lightweight but tough plastic, this slips easily into a pocket or map case and should last you a lifetime.